By Sally Greenberg, NCL Executive Director On Monday I had the honor of attending a wonderful White House event to commemorate the Triangle Shirtwaist Fire. DOL Secretary Hilda Solis and White House Advisor Valerie Jarrett hosted the event, bringing to Washington more than 20 working women from all different backgrounds to talk about their struggles and triumphs on the job. Coincidentally, this is the week the Supreme Court is hearing the case of the women who have formed the class action suit against Wal-Mart for wage discrimination. 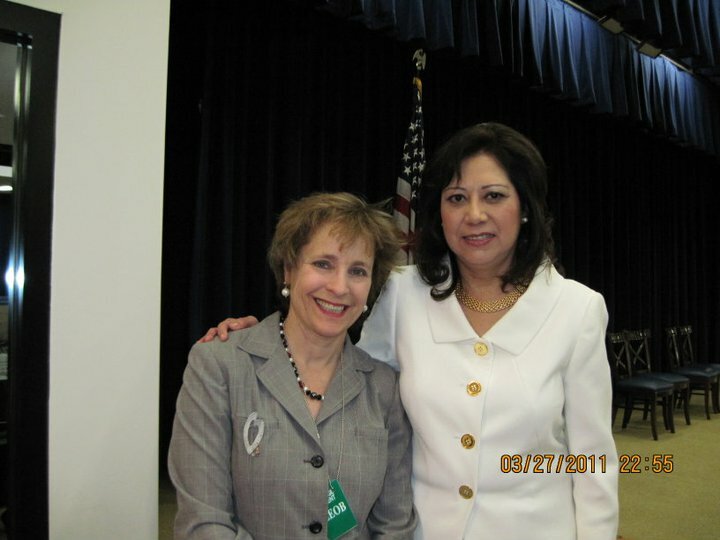 [caption id="attachment_1742" align="alignleft" width="300" caption="Sally Greenberg with U.S. Secretary of Labor Hilda L. Solis"] [/caption] After the attendees watched the HBO documentary prepared about the Triangle Fire, Solis and Jarrett next introduced four women, Deanna Vizi, a child care provider from Ohio, Allison, Julien, a nanny in New York, Ernestine Bassett, a cashier at Wal-Mart in Laurel, MD and Liliana Bequer, a bilingual call center specialist with T-Mobile. Each of these women told their story – and each was more powerful than the last. They all have been leaders among their co-workers. Deanna formed a union for child care providers, Allison helped get a law passed in New York setting basic wage protections and a 40 hour week for domestic workers, Liliana wants T-Mobile to be more worker friendly, and she wants a union there as well, and Ernestine is pushing Wal-Mart to be pay more so its workforce can get off food stamps and housing assistance because the pay is so low. The one thing that all these women had in common was how much they liked their work, respected their employers, and want to make a positive difference for their co-workers. They were later joined by roughly 15 additional women from all varieties of work, including a security officer and a firefighter. After several weeks of events surrounding the 100th Anniversary of the Triangle Fire, this was a wholly new and creative approach to looking at the lives of women who work. It was fascinating and enlightening. Hats off to the White House and DOL for sharing this opportunity to hear from women who work for better pay, better benefits, safer conditions ,and a more enlightened workplace in states across the country.